If for any reason you want to temporarily stop blocking emails, but you don’t want to delete the block, you can pause specific Blocks. When you’re ready to start blocking again, all you need to do is resume the Block. This help article describes how to do just that. Scroll down to Your Block section. 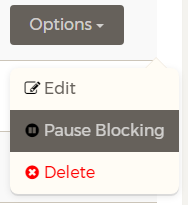 Locate the block you want pause, click the Options button and then select Pause Blocking. The Block will be grayed out immediately and you’ll be notified in the dashboard that the Block has been paused. To resume blocking, click on the Options button and then select Resume Blocking.